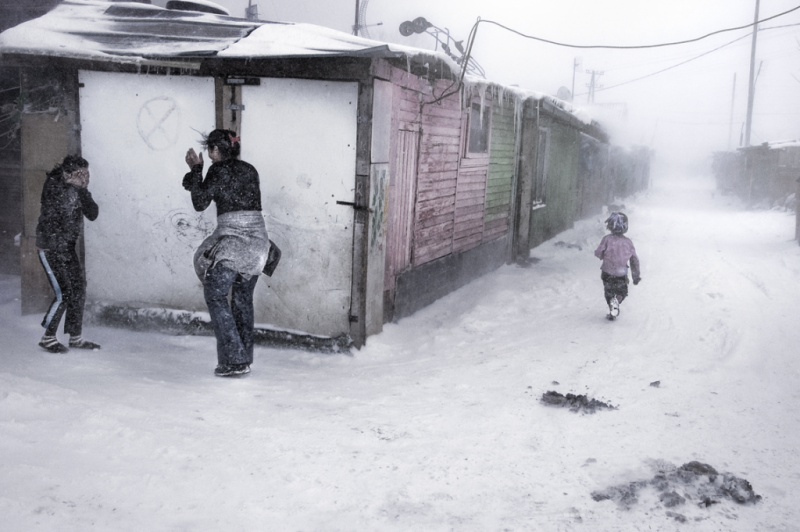 CESMIN LUG, FEBRUARY 2009: The Roma are the poorest minority group in Kosovo. Their houses were burned by Albanians during the conflict, in 1999. The Cesmin Lug camp was a response to the flow of Kosovar Roma refugees and it was projected to be there for only a few weeks. Ten years later, Cesmin Lug is still there. The camp was built on the edge of Mitrovica’s Serb side, on the surface of the biggest lead mine in Europe, and next to a toxic slagheap of 100 million tons. Also, the shacks were built with old lead panels. The Trepca lead mine was closed in 2000 but the slags were never cleaned. 40 families live in this contaminate camp. 77 people have died in Cesmin Lug and another nearby town, Osterode, since 1999, either directly from poisoning by lead, or indirectly from damaged immune systems. In 2004, the WHO recommended the evacuation of Cesmin Lug. Gianluca Cecere was born in 1968 in Naples, Italy. He began to photograph at the age of 7. He is interested in the social reportage and his means of expression is always more often the color. He works as independent photographer for many international publications.